The brilliant, award-winning author of American Canopy presents a dazzling account of the epic quest to link North and South America with the world’s longest road—the Pan American Highway—and how its construction and evolution reflected the divergent fates of North, Central, and South America in the nineteenth and twentieth centuries. The Pan-American Highway is the longest road in the world, running the length of the Western Hemisphere from Prudhoe Bay in Alaska to Tierra del Fuego in South America. It represents a dream of friendship, commerce, mobility, of the Americas united. Our collective imaginations have been forged along its path: Ernesto “Che” Guevara, the iconic Argentine revolutionary, traveled it northward in The Motorcycle Diaries; Jack Kerouac, the voice of the beat generation, followed it southward in On the Road. Many adventurers have journeyed the highway’s distance, but the road itself still remains shrouded in mystery. Why was it built? And why does it remain unfinished, with a sixty-mile long break, the famed Darien Gap, enduring between Panama and Colombia? In Eric Rutkow’s “richly detailed examination of efforts to build a highway from Alaska to the tip of Argentina…[this] fresh, well-documented account” (Kirkus Reviews) chronicles the full story of the highway’s long, winding path to construction, which reshaped foreign policy, cost US taxpayers a billion dollars, consumed countless lives over a 150-year period, and changed the destinies of two continents. 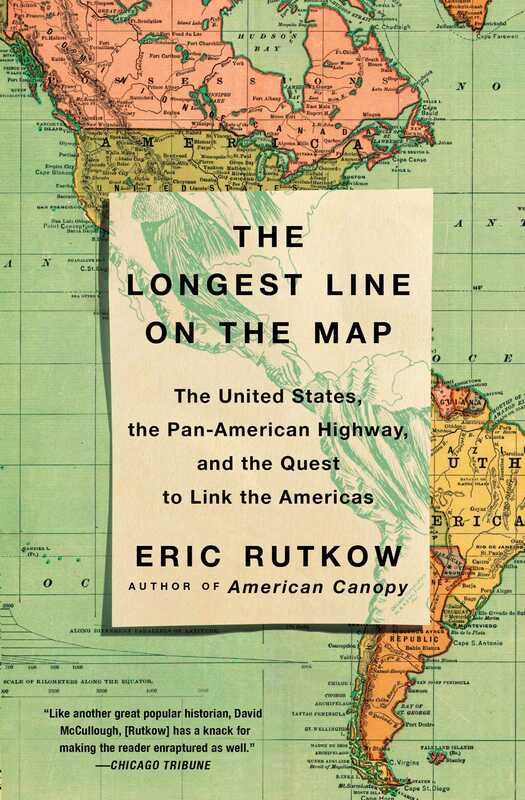 Fully illustrated with photographs, documents, and maps, The Longest Line on the Map offers readers a bird’s eye view of the incredible highway that snakes through more than a century’s worth of US and Latin American history, ending in a triumphant ideology that insists the Americas share a common destiny and mutual interests.